Photogrammetry analysis to determine a suspect’s height and thus identity. Biomechanics and injury analysis to determine who was driving. Accident reconstruction to determine vehicle speeds. Fire investigation, computer simulation and trial graphics to determine origin and cause in an arson and murder case. 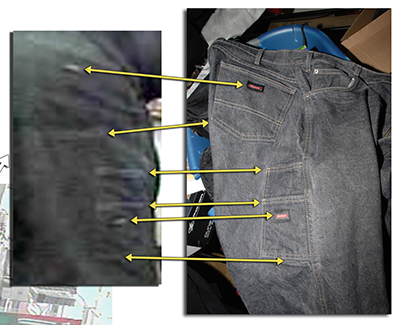 Comparison of pants image from a robbery surveillance video to pants found in suspect's apartment. Demonstrative evidence trial exhibits to help jurors understand complex events, the significance of physical evidence, and expert testimony. Audio analysis to clarify a suspect’s recorded discussion. Surveillance video processing and enhancement to aid investigation, analysis and trial presentation.